Powers/Abilities: A seasoned combat veteran of exceptional skill, Castle possesses the normal human strength of a man his age, height and build who engages in intensive regular exercise. A former U.S. Marine Captain with a distinguished combat record, Trevor Castle is well-versed in the arts of warfare and hand-to-hand combat. As the Punisher, he employs an exhaustive arsenal of portable weaponry. (Bullets and Bracelets#1 (fb)) - United States Marine Captain Trevor Castiglione's coming of age occurred while he was fighting in the jungles of Southeast Asia. (Bullets and Bracelets#1 (fb)) - While on leave from the military, the world as Castiglione knew it ended during an innocent picnic in the park with his wife and children. His future was forged when he and his family were caught in a Mafia crossfire. With his wife, son, and daughter all gunned down before his eyes, Castiglione declared a war on the mob. 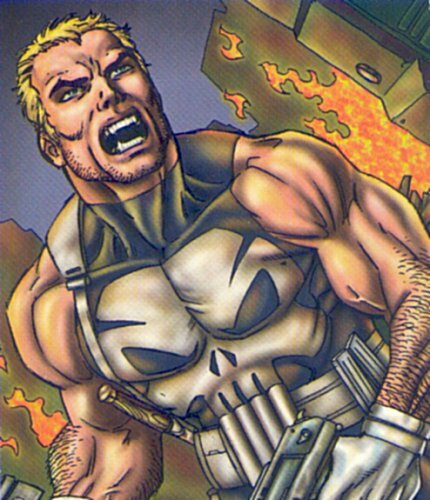 Going AWOL, the weapons specialist became the gun-toting vigilante known as Castle, the Punisher. His one-man vendetta against the mob gained him infamy in the New York City underworld. (Adventures of Spider-Boy #129) - The first on-panel appearance of Castle. In New York City, Castle and Spider-Boy (Pete Ross) crossed paths for the first time. The effervescent Spider-Boy appointed himself as the violent vigilante's sidekick -- until Castle found the right "caliber" argument to shoo the arachno-pest away. (Castle) - As Castle's one-man war against organized crime continued, he had a waterfront standoff against the cocaine kingpin known as the White Whale. It was during this time that Castle met Orion, the errant son of the evil Thanoseid who briefly left his native planet of Apokolips to pose as an Earth mob-boss named "O'Ryan." The moment Castle and Orion locked eyes they knew they were two of a kind. Castle believed that Orion was the greatest warrior he had ever met. 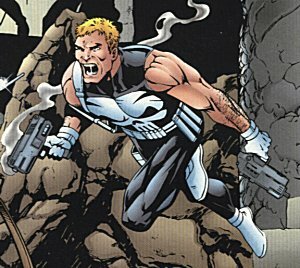 (Castle#18) - But Castle's career as the Punisher was not without its hardships. After one particular gunfight with the mob, Castle was left in a New York back alley dying of his wounds. Luckily, the rogue Amazon princess known as Diana Prince found the wounded Castle and nursed him back to health, saving his life. (Bullets and Bracelets#1 (fb)) - Castle and Prince began a romantic relationship. Though first dates often become first fights, the initial pairing of the super-powered Amazon Prince and her bullet-blasting suitor Castle turned deadly when the duo battled the grisly horror of the Pelt Man (Billy Minerva). Castle and Prince ultimately prevailed over the Pelt Man. (Secret Crisis of the Infinity Hour#1) - Summoning the heroes of Earth, Dr. Strangefate (Charles Xavier) informed them that the evil Thanoseid had acquired the five Infinity Links, which would combine to form a time halting vortex known as the Infinity Loop. Already, the damage had begun as red rains fell, skies darkened, and reality itself began to disintegrate. The Amalgam Universe would be destroyed in one hour's time. Castle and Prince were transported to Thanoseid's planet Apokolips by one of Dr. Strangefate's mystical spells and found themselves deep within the catacombs of the alien world. Their mission was to establish contact with the rebel underground led by Scott Free and his band of New Asgardians. Castle and Prince completed their objective and Scott Free joined the assault against Thanoseid. Castle was also reunited with his old friend Orion, who assisted the rebel underground in their fight against his evil father. (Secret Crisis of the Infinity Hour#6) - With the Infinity Links fused into the Infinity Loop, Thanoseid was held at bay while the Apokoliptan rebels Scott Free and Orion simultaneously struck the Infinity Loop -- sacrificing their lives to fracture it. Disrupted, the Loop disintegrated -- its Links exploding in a massive shower of stars. Castle envied Orion's glorious death. (Secret Crisis of the Infinity Hour#7) - The heroes of Earth eventually thwarted Thanoseid's mad scheme. Both Castle and Prince were present when American Girl (Carol Barnes), the former sidekick of Super-Soldier (Clark Kent), heroically sacrificed her life to further the heroes' cause. 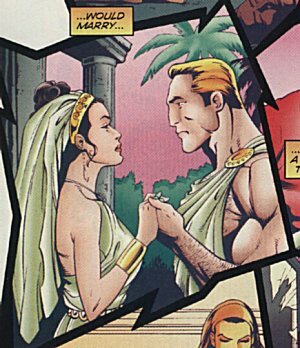 (Bullets and Bracelets#1 (fb)) - Despite their seemingly irreconcilable differences (Prince abhorred Castle's lethal tactics), Castle and Prince fell in love and the two eventually got married on Themyscira. They soon had a baby of their own and named him Ryan Castiglione (in honor Castle's deceased friend Orion, who once used the alias "O'Ryan"). Unfortunately, the differences between Castle and Prince drove them apart shortly after Ryan's birth. (Bullets and Bracelets#1 (fb)) - Thanoseid, the ruler of Apokolips, orchestrated the kidnapping of young Ryan from Diana Prince's home (although Diana had no idea who was responsible for her son's abduction). (Punisher#90-99) - Castle learned of Ryan's abduction and set off to find his missing son. His quest, which followed a long and tortured path, ultimately led him to the stronghold of the organization known as the Hand. Coincidentally, Prince's search for Ryan had also led her to the Hand stronghold and the estranged couple were reunited. (Bullets and Bracelets#1) - "Final Thrust" - Castle and Prince, reunited during the search for their missing son, stormed the Hand stronghold, leaving many dead Hand assassins in their wake. As they advanced further into the Hand stronghold, War Monarch (who was rumored to be the one behind Ryan's abduction) appeared as a holographic image and trapped Castle and Prince between two brick walls. War Monarch admitted that he was the manipulator of the scenario, but claimed that he was not the true power or motivator behind the abduction of Ryan. War Monarch then opened a Boom Tube under Castle and Prince that transported them to the Armaghetto district of Apokolips. After recovering from their inter-dimensional jump from Earth to Apokolips, Castle and Prince parted ways. As Castle headed toward the Tomb of Orion in search of more firepower, Prince headed toward Granny Harkness' Orphanage in search of Ryan. Castle arrived at Orion's tomb and quickly dispatched the two Parademon guards standing at the tomb's entrance. As he entered Orion's tomb, Castle reminisced about his friendship with Orion and envied his glorious death during the SECRET CRISIS OF THE INFINITY HOUR. Having a hunch that Orion was buried in full regalia, Castle opened his casket and borrowed his fallen friend's Astro-Glider. Meanwhile, Prince had been ambushed by the Female Furies on her way to Granny Harkness' Orphanage and taken to Thanoseid. Thanoseid ordered the shackled Prince to reveal the location of the Infinity Links. Prince insisted that they were destroyed, but Thanoseid did not believe her and threatened to kill Ryan if she would not talk. Just then, Castle, wearing Orion's helmet and piloting the Astro-Glider, burst into the room. Thanoseid, believing that Castle was Orion returned to life, was taken aback for a moment. Castle took the opportunity to free Prince from her energy shackles and the two began to battle Thanoseid's assembled minions. Thanoseid, annoyed by Castle's interference, struck young Ryan with his Omega Beams, causing the baby to disappear in a flash of light. Trevor immediately assumed that Thanoseid had destroyed his son and was about to kill Thanoseid's minion Kanto for his participation in Thanoseid's scheme, but Prince (realizing that Thanoseid's Omega Beams had the ability to bend space and time) deduced that Thanoseid had merely sent Ryan back in time so he could be raised on Apokolips as Kanto -- Thanoseid's personal assassin. Diana explained to Trevor that it would have been Thanoseid's ultimate revenge to have Trevor kill or be killed by his own son (just as Thanoseid's errant son Orion was killed defying his father's will during the SECRET CRISIS OF THE INFINITY HOUR). When Diana looked into Kanto's eyes earlier she had realized that he was her son Ryan -- and Kanto subconsciously realized this as well, explaining why he found himself unable to kill Diana earlier. Disgusted that his master plan did not come to fruition, Thanoseid struck Kanto with his Omega Beams again and sent him to live with Highfather Odin and the New Asgods across the Bifrost Bridge in the gleaming realm of New Asgard. Castle and Prince were similarly sent back to Earth were they reconciled and decided to give their marriage a second chance. Marvel characters are listed in regular, or bold black type. DC characters are listed in bold blue type. Amalgam characters are listed in bold purple type. After Castle's debut in February 1974's ADVENTURES OF SPIDER-BOY #129, fans clamored for more, and Amalgam Comics responded with the first of many CASTLE titles, which featured the waterfront standoff between Castle and cocaine kingpin, the White Whale. In a bid for female readers, Prince (Princess Diana of Themyscira), the Amazing Amazon, was introduced into the CASTLE series in issue#18. In case you're confused, Amalgam Comics didn't really exist beyond those seen in the few DC/Marvel cross-overs. The titles you don't recognize are amalgams of similar Marvel and DC comics--Snood. 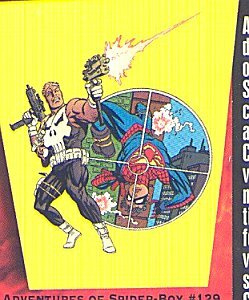 ADVENTURES OF SPIDER-BOY is an amalgam of Marvel's AMAZING SPIDER-MAN (Marvel's Punisher (Frank Castle) debuted in AMAZING SPIDER-MAN (vol. I)#129) and DC's ADVENTURE COMICS. 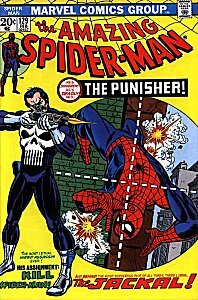 The cover to ADVENTURES OF SPIDER-BOY #129 (the issue where Punisher (Trevor Castle) made his Amalgam Comics debut) is based on the cover to February 1974's AMAZING SPIDER-MAN (vol. 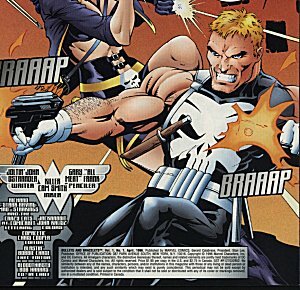 I) #129 (the issue where Punisher (Frank Castle) made his Marvel Comics debut). The SECRET CRISIS OF THE INFINITY HOUR is an amalgam of Marvel's SECRET WARS and THE INFINITY GAUNTLET and DC's CRISIS ON INFINITE EARTHS and ZERO HOUR. Special thanks to writer John Ostrander for clarifying some of the component sources for his amalgamated characters and providing some additional insight into the Amalgam Universe! • Q: Where did the name "Ryan" come from? Special thanks to penciler Matthew Haley for identifying Castle as one of the characters present at the death of American Girl (Carol Barnes) in SECRET CRISIS OF THE INFINITY HOUR #7. Doomed by an ancient ritual to change into the form of a blood-thirsty cheetah, Billy Minerva takes out his bestial anger on beautiful people -- clawing their faces to scar them as horribly as he's been scarred as the Pelt Man. The Pelt Man attacked Castle (Trevor Castle) and Prince (Princess Diana of Themyscira) on their first date, but they were able to thwart his feral assault. 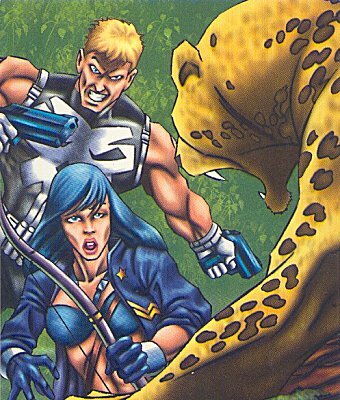 Pelt Man (Billy Minerva) is an amalgam of Jigsaw (Billy "the Beaut" Russo) of the Marvel Universe and Cheetah (Dr. Barbara Ann Minerva) of the DC Universe. 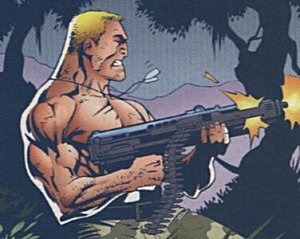 White Whale is a New York City cocaine kingpin who was involved in a waterfront standoff with Castle (Trevor Castle) in the early issues of his first series. White Whale is an amalgam of the Kingpin (Wilson Fisk) of the Marvel Universe and Tobias Whale (the albino leader of The 100 crime syndicate) of the DC Universe. Also assume that the Amalgam characters have no other connection to any others than whom they are Amalgamated, unless specifically mentioned. All characters mentioned or pictured are &trade; and � 1941-2099 Marvel Characters, Inc or DC Comics. All Rights Reserved. If you like this stuff, you should check out the real thing!